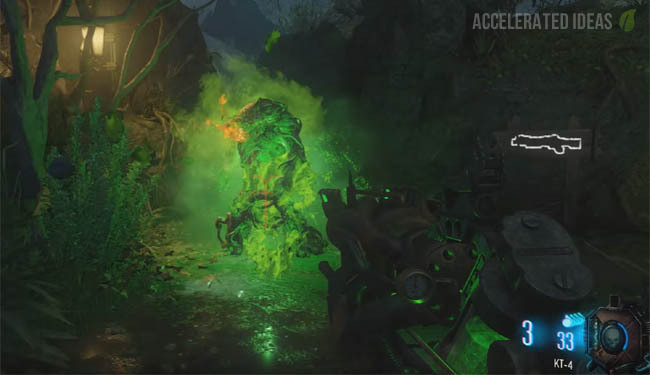 The KT-4 is one of the new buildable items in Zetsubou no Shima. In this guide I'll show you where to find all of the parts for the KT-4 and explain how this gun works. Strangely, the weapon is like a cross between the Acid Gat from MotD and the Sliquifier from Die Rise. It's full name is Kusanagi No Tsurgia. At first glance the KT-4 appears to be a really weak weapon but that's probably because it's only really effective when it's charged up. Holding down the fire button will charge this weapon until three green bars appear above the weapons sights. At this point the weapon will deal increased damage especially against the Thrasher. In fact, if you charge the weapon to the max then the Thrasher BOSS becomes a one shot problem; simply charge, shoot, and watch his orange pustules explode as the green acid burns through his weak spots.. Following a charged shot the KT-4 also leaves a nice little pool of acid on the floor. Any zombies that come into contact with this pool will suffer tremendously This makes the weapon a perfect train compliment but at the same time a risky primary, simply because getting stuck in a corner with the KT-4 is hopeless!! Don't make the mistake of thinking that the KT-4 is any replacement for the wonderful bows from Der Eisendrache. If you prefer a video walkthrough check the YouTube video below, otherwise keep reading for the text guide. Tip: It's worth collecting parts 2 and 3 first because this part has a minimum round requirement. Wait until you have turned on the power and find the regular zombie carrying a green item. He appears like any normal zombie as soon as you have turned on the power switch in the bunker. Simply kill the zombie holding this item and then its yours to pick up. Make your way to Lab A, turn on the power and then lower the circular cage (near the generator) using the control panel. Find where the cage dropped down to and you should see a smoldering purple arm inside the cage. Now lure a spider into the cage which is best done during one of the early spider rounds, but you can revisit Lab A in later rounds and a single spider will spawn in to help you. Once the spider is trapped inside the cage, run back up to the facility and call the cage back up to it's starting point. Wait a few seconds for the machine to extract spider venom, collect it and you now have the second part for the Kt-4. The red plant is located underwater in the series of small tunnels and caverns. 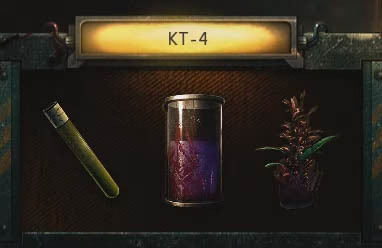 Make your way to lowest level of the Communications Center (in the Bunker) where the KT-4 workbench is (see image below). Open the door immediately on your right, you should see the wall weapon inside and the route that leads through to a flooded underground tunnel network. Swim through the tunnel as far as you can go, keep going until you start to see the railway tracks on the floor and eventually the blue 115 rocks, which seem to increase in number as you go deeper. Look for the really deep cavern and dive to the very end where you should find the red plant, ready for you to pick up. Tip: Pop the orange bubble to get some much needed air and then swim back up without dying. Interact and choose "Create formula"
Apply the missing parts that you have just collected, wait about 5 seconds and the weapon is yours to pick up and use. The KT-4 can be upgraded to a superior version called the Masamune by finding and mixing new formulas (x 3). These formulas are in fact new parts that are collected through a series of "easter egg" style puzzles. See below for the upgrade parts. The blue plant can be found in the same area as the original red plant for the base weapon. However, there are a series of steps required before the blue plant appears behind the rock face. First, fill your bucket with Rainbow water. To do this traverse the sewer pipes (the ones where you travel incredibly fast). The second sewer pipe which leads away from the bunker towards Lab B is the one we're interested in. Time it perfectly and press Square when you see the 115 rocks (end of the second blue section). If timed perfectly you will get Rainbow water in your bucket. The video below will help if yo're getting trouble. Next swim down to the location where the red plant was, take out the Skull of Nan Sapwe and scan the rock face (using Mesmerize) - opposite wall of the red plant location. This will make the wall crumble and reveal a new plant location. Plant a seed at this location and use the rainbow water to help the plant grow. Repeat the process of watering the plant for three rounds then collect the blue plant that has grown at this location. Make sure you have your Zombie Shield electrified (see video tutorial if unsure). Head over to the cage mechanism in Lab B. Equip the shield and melee the control panel for the cage. It should spark and the cage door opens. Walk into the cage and head down underground. The area is bright blue with a skeleton lying on the floor. Pick the vial up from his rib cage. The final upgrade item is recovered from the dead body of the secret Spider BOSS. If you're not sure where this spider is see this video. Finish off the spider and walk up to his body, hold down Square and the next part is yours to keep. If you already killed the spider in an earlier round just revisit this area and it'll be here. Once you have all the new parts, return to the original KT-4 workbench (mixing station) and add the new formula. The base weapon is then replaced for the Masamune. The upgraded version fires blue plasma rather than green, and each dose is considerably stronger. In fact, even at round 40 the Masamune can kill large groups of zombies and Thrasher's in a matter of seconds. You MUST have the upgraded version if you want to complete the main Easter Egg.